A faithful resurrection of the MS-20, at a crazily good price. Everyone should own one! It's an authentic MS-20 but just smaller. MIDI/USB and mini-jack patchbay. Super affordable. Sideward play on small dials. That's about it! The Korg MS-20 monophonic analogue synthesizer was originally launched in 1978 (discontinued in 1983) and is certainly one of the most iconic mono synth's of recent times. Initially regarded as a poor man's ARP 2600 because of its similar semi-modular/ patchable design, it soon became a cult classic within Dance and Electronic circles, largely due to its versatile dual filters which enable the easy creation of twisted sounds, killer FX, drum hits and staple leads and basses. Plus its relatively stable tuning (in our experience at least) easy mod-ability and rugged build added to its popularity. Back to 2013 then, the fact that most of the oscillator and filter R&D was already done for the Monotron and Monotribe series, sky-rocketing used prices of the original and the popularity of Korg's iMS-20 and Legacy Collection MS20 it's easy to see why Korg have chosen to re-launch the analogue MS-20 in 2013. It's a real treat to have a brand new, albeit smaller fully-analogue MS-20 before us. Although this writer owns an original model, it's still a very exciting prospect as it's the first direct no-holds-barred recreation of a true classic from one of the world's premier synth manufacturers. The MS-20 mini looks and feels like an MS-20, though of course it's lighter and its more compact size makes it easier to gig with. Though we do hope Korg will make a gig case for safe transportation as there aren't many off the shelf solutions that fit an L-shaped keyboard with three-quarter size keys! "The biggest advantage of the MS-20 mini over the original is the addition of a MIDI In port on the back and MIDI over USB"
The construction is solid (just like the original) with a metal main chassis and tough plastic ends. Taking a quick peak inside (we couldn't resist) it's very cleanly built and there's loads of empty space too. Some folks who tried the MS-20 mini at the NAMM show in January reported that it felt cheap, but this just isn't true. Our only complaint is that the smaller dials have too much sideward play (the big dials are rock solid), which makes setting them accurately a little more difficult than the original. This is particularly pertinent for the master-tune and fine-tune dials and it's sometimes difficult to get Osc 2 totally in tune with Osc 1 without careful tweaking (there's no oscillator sync on board). You may be wondering why Korg chose the smaller size overall (it's 14% smaller, to be exact). Well, the original designers (who also designed the mini) say this was so as not to devalue the original models, though they seem to be forgetting that its more compact ￼form factor will be more appealing to many. The mini's three-quarter size keyboard feels surprisingly good too. It's fast to play, nicely balanced, feels better quality than the original's clanky affair and the keys are even big enough for people with sausage fingers (like this writer). Plus you can actually span a greater distance than on the original, making jumping octaves easier. Though the full-size keys of the original are definitely more comfortable and easier to hit accurately, on the whole this three-quarter size keyboard does a great job. That said, easily the biggest advantage of the MS-20 mini over the original is the addition of a MIDI In port on the back and MIDI over USB. Unfortunately there's no MIDI CC or velocity transmission or reception (only note on/off) but adding these features would have no-doubt increased the cost. Yes, there's not much to complain about here as this is a brand new authentic MS-20 with MIDI costing around £500 street. That's almost £1,000 less than the current second hand prices for an old one. There are inevitably some prices to pay here. The MS-20 mini uses modern surface mount components which means it's harder to mod than the original (i.e. for osc sync or PWM) but the designers have attested to using as close to the original transistors and components as possible at every point in the circuitry and have proved their commitment to making the MS-20 mini an authentic recreation. That said, the oscillators are digitally stabilised like the Monotribe (confirmed by Korg's Rich Formidoni at NAMM) but they still sound extremely close to the original's and haven't lost any of the vibe. All waves and options are exactly like the original, so Osc 1 has tri, saw, variable square/pulse (though still no PWM) plus white noise (which sounds just like the original's), while Osc 2 has saw, square, pulse and ring modulation. Footages (pitches) are still the same, with the lowest available on Osc 1 being 32' and the highest pitch 4', whereas the lowest on Osc 2 is 16' and the highest 2'. Plenty of range then, plus you can get even higher as the fine tune dial on Osc 2 has a very wide range, giving over an octave above the 2' setting. You can also get the MS-20 Mini to go way lower than 32' by using the EG1/EXT dial and the fine tuning/ master tune dials. "Making subs, kicks, snares, hats, squeals, shrieks and deep basses is scarily easy"
So what does it sound like? Well, those VCOs are chunky enough for any heavy bass or cutting leads and when run through the filters, will rattle any PA system to bits or produce high end that can shear your ears off (if desired). This sonic versatility is why the MS-20 mini is so great. Making subs, kicks, snares, hats, squeals, shrieks and deep basses is scarily easy and though it's not as refined as a Moog, its unique sound is just as useful and if anything, more relevant. The portamento is deliciously smooth (one of the nicest sounding on a mono) and has a very long sweep, which we love. The real heart of the MS-20 mini is its high-pass and low-pass filters, both of which can be overdriven and sent into self-oscillation, plus of course the envelopes and mod section. However... There were two different types of filters used in the original MS-20s depending on when they were made: the custom Korg 35 filter or the OTA filter used in later models that used off the shelf components. Many people say that the 35 overdrives in a more pleasing way than the OTA version, which many feel doesn't sound quite as edgy. Thankfully, the designers have also recognised that the Korg 35 filter has the sonic edge and it's this design they have chosen for the MS-20 mini. Result. What's great (in terms of this review, especially) is that our original MS-20 also has the Korg 35 filter, so for comparing the sonics side-by-side it's a perfect setup. Note that many of the current online comparisons don't specify which filter their original's have when doing audio comparisons but this review is truly comparing like with like. Just 35 years apart. "We're hugely pleased to report that the MS-20 mini's filters sound very close to the original Korg 35 filter"
We're hugely pleased to report that the MS-20 mini's filters sound very close to the original Korg 35 filter, though there are some subtle differences. On our original MS-20 the high-pass filter can pretty much cut out the entire low end down to nothing, whereas on the mini, more of the sound is left intact when fully hi-passed. The low-pass filter sounds subtly different too, opening brighter in the top end and perhaps even a little lower in the lows but its midrange is also slightly less pronounced than the original, which means that the resonance bites at a different point when matching settings like-for-like on the mini and original. This is true for the resonance on both the high-pass and low-pass filters. Again, the resonance (particularly on the low-pass) is a little cleaner at its extreme settings and it tends to sit on top of the oscillator sound a little more, whereas on the original, the resonance blends with the oscillator tone a little more and the sound breaks up more insanely at the extremes of the keyboard. One final difference is that the filters don't drive quite as hard as the old MS-20 in the high mids. For example, our old MS can sound like you are driving the oscs through a '70s fuzz pedal when the low-pass is set to high resonance and cutoff set to medium, whereas the mini is a little more subtle at the same setting, with slightly less mid-range breakup/vocal growl. Though - as with the original which grew 'darker' with age - this may change as the mini gets older. Don't get us wrong. This isn't to say it sounds bad in ANY way but it's important to highlight any differences between a brand new 2013 mini and that 70's classic original. To conclude, the MS-20 mini has the mojo we were all hoping for, just the tighter tolerances of modern components have subtly changed the sound, though it certainly sounds as 'good' as an old one. As Korg say on their website 'the sound of the MS-20 mini has a somewhat bright and extreme quality to it because its sound is that of an original MS-20 in mint condition, at the time it went on sale, before any of the components aged'. This sums things up perfectly and really, it's only owners of the old model that could ever notice these differences when doing a direct comparison. Even then, when the sounds on the old and new model are static, there's very little difference - you only really notice when sweeping the filter or tweaking the envelopes, which have a slightly different response. New purchasers will be made up with the scope of sound the MS-20 mini can produce for the money. It's a great synth to learn synthesis on (experienced synthesists won't get bored of it either) and the fact that it's a sonic chameleon that can do staple sounds and can also excel at more off-the-wall stuff too, makes it a no-brainer purchase. We don't believe owners of the original will want to sell up anytime soon, nor should its value drop significantly either. After all, it's still a classic for good reason and the full-size keyboard, quarter-inch jack patchbay and slightly more vocal/growling tone do make a difference. However, we reckon original MS-20 owners will definitely want to buy an MS-20 mini for using live and that's pretty much the best compliment anyone could give. Korg has really done an amazing job recreating the MS-20 so authentically and should be firmly congratulated for breaking the mold, listening to the synth community and bringing it to market for around £500 street. 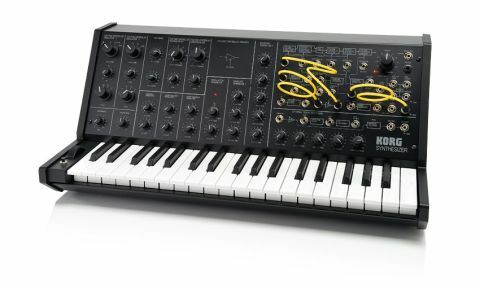 We sincerely hope the MS-20 Mini will spearhead many new Korg analogue synth's/products. Perhaps one day a Korg analogue poly, drumbox or sequencer even? How about bringing back the SQ10? And perhaps their trail- blazing move might kick-start the likes of Yamaha and Roland into bringing some of their old favourites back to market. We hope so.